The Nem Thuong Pig Slaughter Festival in Vietnam has been condemned by animal rights activists for a long time due to its heinous nature. In 2015, the Vietnamese government banned it due to that pressure. However, it turns out the festival continues on, just in a smaller fashion. This year (2019) the festival will happen on February 5 at the lunar new year if we don't stop it! 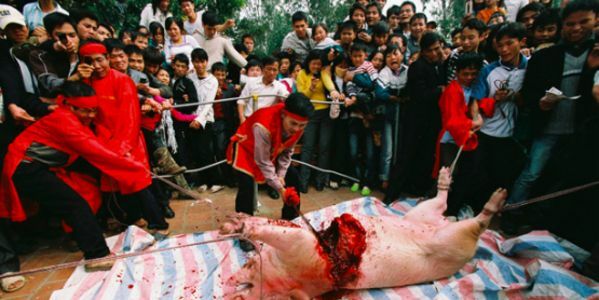 Please sign the petition to ask Vietnamese authorities to actually end this torturous festival! During the festival, pigs are carried for miles with people feeding them cookies and water. Then, ropes are tied to each of their limbs and they are pulled in four different directions while someone takes a sword and either cuts them in half or decapitates them. It's truly a tragic and cruel activity. The current festival is more secretive so we don't actually know how much of the torturous behavior is going on. But we know the main event of killing pigs publicly and heartlessly continues. If Vietnam is really serious about responding to activist's calls, they would fully close down this part of the festival. For now, all they have done is make the festival slightly smaller and more secretive, neither of which really helps save these pigs. Pigs are smart and feeling creatures and they do not deserve to die for human sport, especially not in this incredibly inhumane fashion. We are so happy the festival has been toned down, but now we need to ensure that zero pigs are being slaughtered in this way. Will you sign the petition to ask Vietnam to ban all pig slaughter during this festival? We only have until Feb 5, 2019 to make our voices heard this year!